Gillette, the razor company, has launched a new advertising campaign that I find particularly offensive. Over visuals of men sexually harassing women, husbands yelling at wives, and little boys wrestling, it calls on men to curb their "toxic masculinity." Generously, the paragons at Gillette, admit that "some men" already do, but, piously, insist that "some is not enough." Why doesn't Gillette stick to cutting facial hair? As my wife asks, quoting her mother, "Who died and left Gillette in charge?" Why is the razor company promoting negative and inaccurate stereotypes of men? I am boycotting Gillette and switching to Harry's' razors (available mostly online). 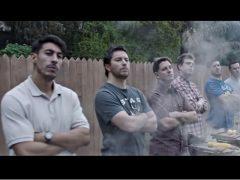 WE, the Undersigned, demand Gillette stop its ad campaign demeaning men! Please sign this petition telling Gillette to stop bugging and demeaning its customer base. Your signature will count! We will send an email in your name to Procter & Gamble, the parent company of Gillette, telling them of your position!